In a perfect world, I’d be cooking this dish from a Tuscan villa perched high on a cliff overlooking the Mediterranean, using ingredients found at specialty shops or open air markets with a gorgeous Italian guy by the name of Lorenzo or something waltzing in with a crate of wine from a nearby vineyard and pouring us two glasses. The reality is that I’m cooking this dish while standing in my small studio kitchen using the cheapest ingredients I found at my corner grocer and looking out the window to the one directly opposite mine where my neighbor is, quite literally, a naked artist. He paints at odd hours of the night and I’ve never seen him wear any clothes. That’s another story, though. The good news is that while I can barely afford my groceries, I can at least render the flavors from some of Italy’s most popular dishes. 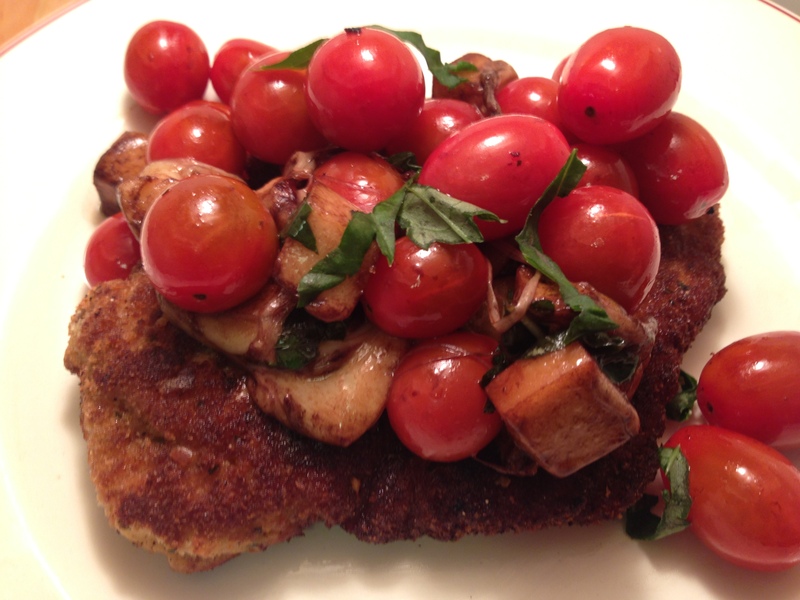 Typically, I’d top this chicken with my Simple Arugula Salad for a more classic milanese. But I decided to dress it up with my twist on the classic caprese salad by using smoked mozzarella and cherry tomatoes tossed with olive oil and shreds of basil. Finally, I tossed it with warm balsamic vinegar for a little added tang. This dish is rustic, colorful and delicious. 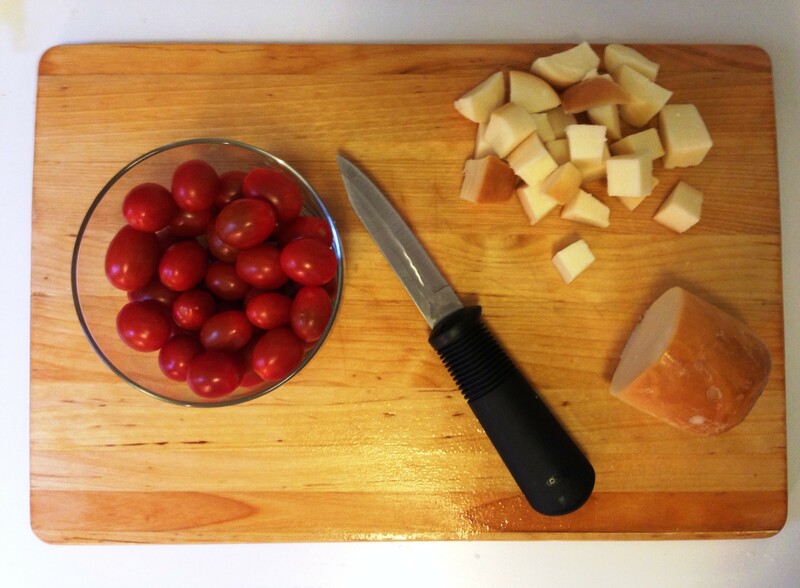 I begin by creating the caprese salad. If the tomatoes are too large, I’ll slice them in half. Otherwise, I’ll toss them together with cubes of smoked mozzarella about the same size. 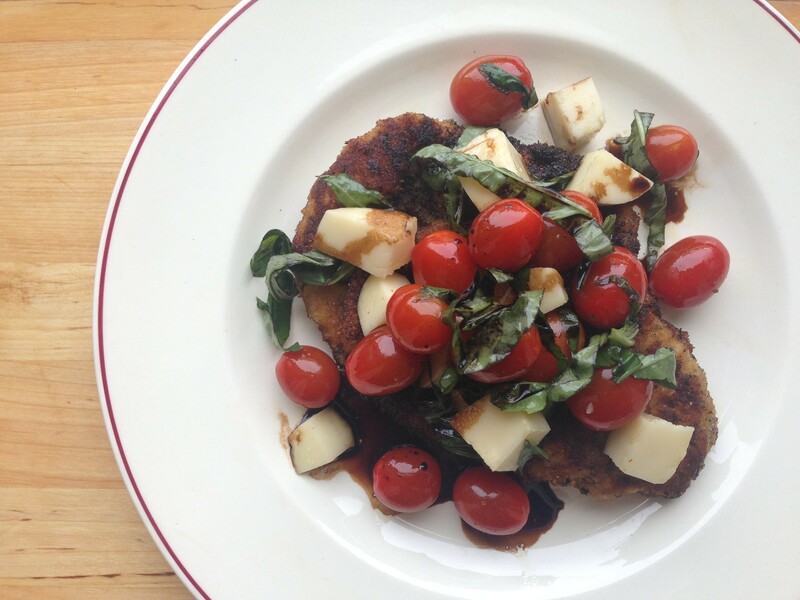 I’ll then toss the tomatoes and cheese together with shreds of basil. 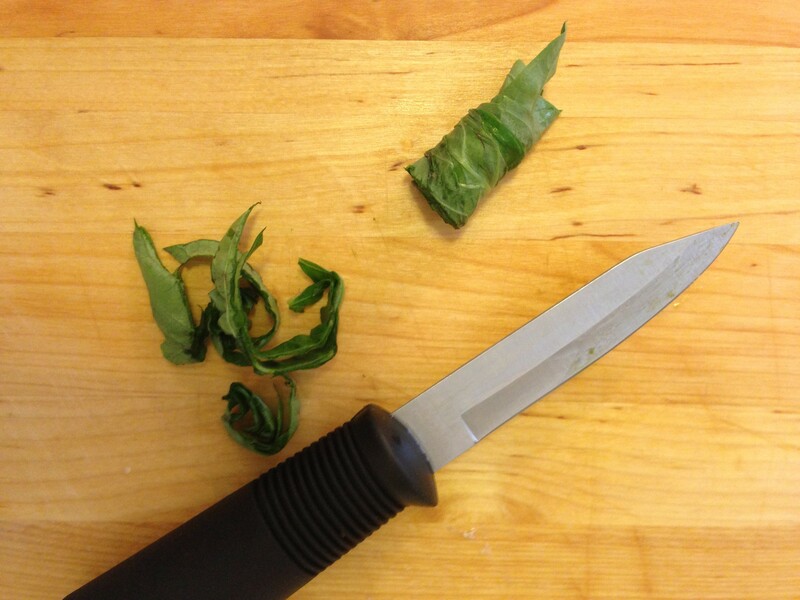 I like to roll up 2-3 large basil leaves inside one another then slice them as pictured below so that I get long shreds. It looks really pretty. 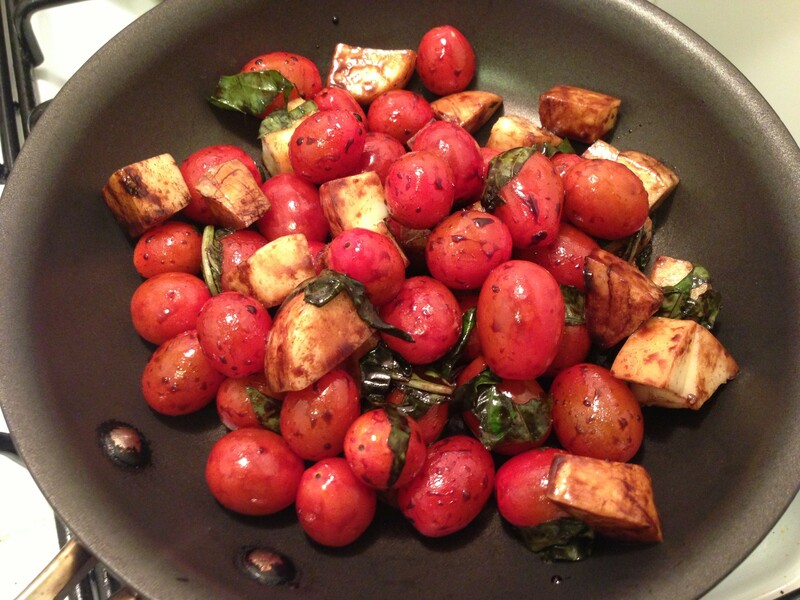 I then toss the tomatoes, mozzarella and basil together with a little olive oil, salt and pepper. Now begin prepping the chicken by pounding it until it’s thin. 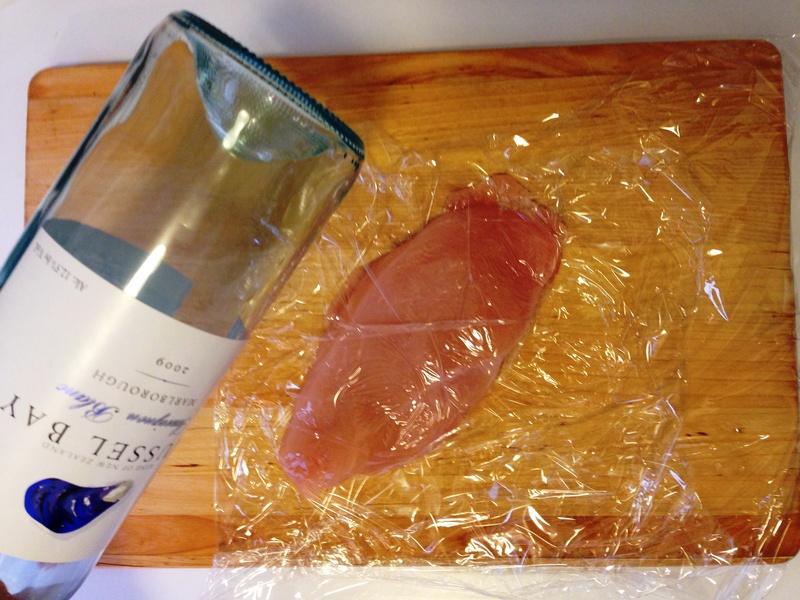 To do this, I place a single breast in plastic wrap and whack it with whatever does the trick. I use a wine bottle of course… Just don’t go too crazy. You don’t want shards of wine bottle all over your kitchen. Next, I season both sides of the breasts with salt and pepper. Now comes the challenging part–trying to arrange my one piece of counter space to bread the chicken (hopefully you don’t have my same problem). Set up three bowls: one for the flour, one for the bread crumbs and one for the egg. Lightly beat the egg with a fork. Meanwhile, heat a frying pan on the stove with a generous few tablespoons of olive oil over medium heat. There should be enough oil to lightly coat the bottom of the pan. Now time to bread the chicken while the oil heats up. 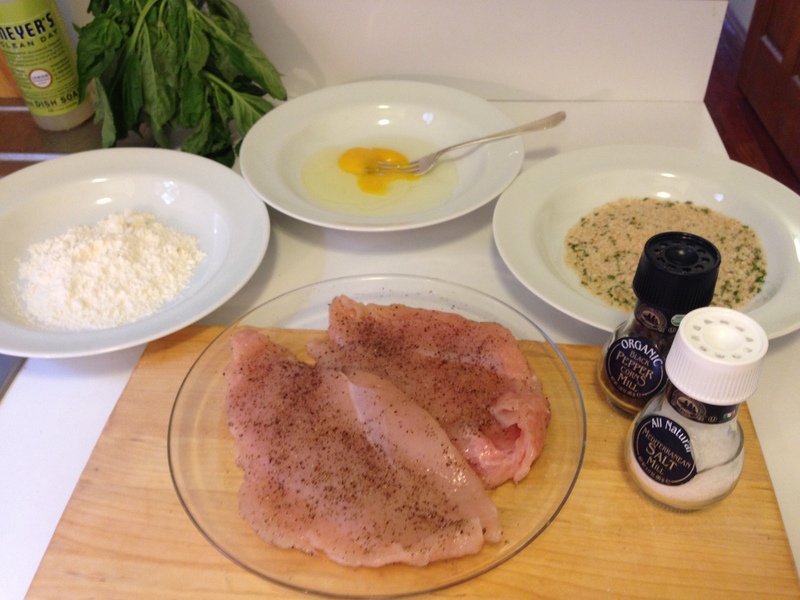 Take one of the seasoned breasts and dredge it in the flour and shake off any excess. 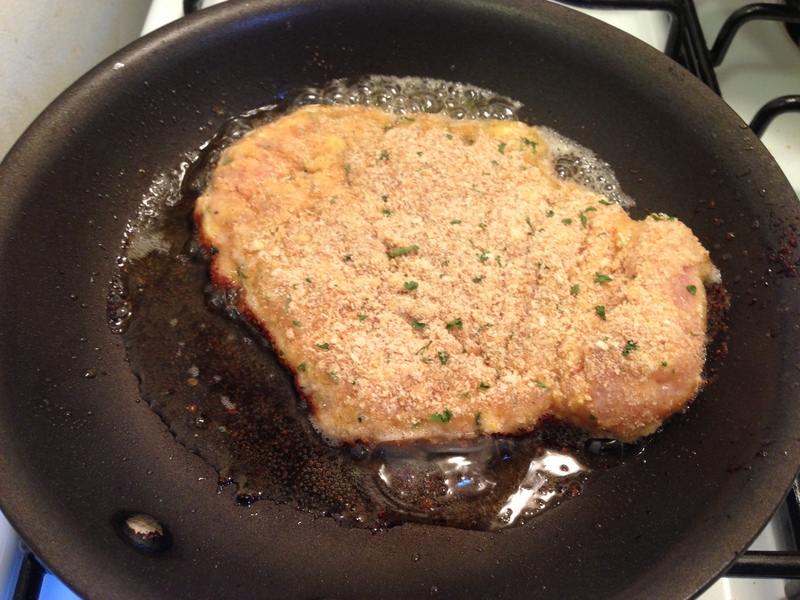 Now dip the floured cutlet into the egg. 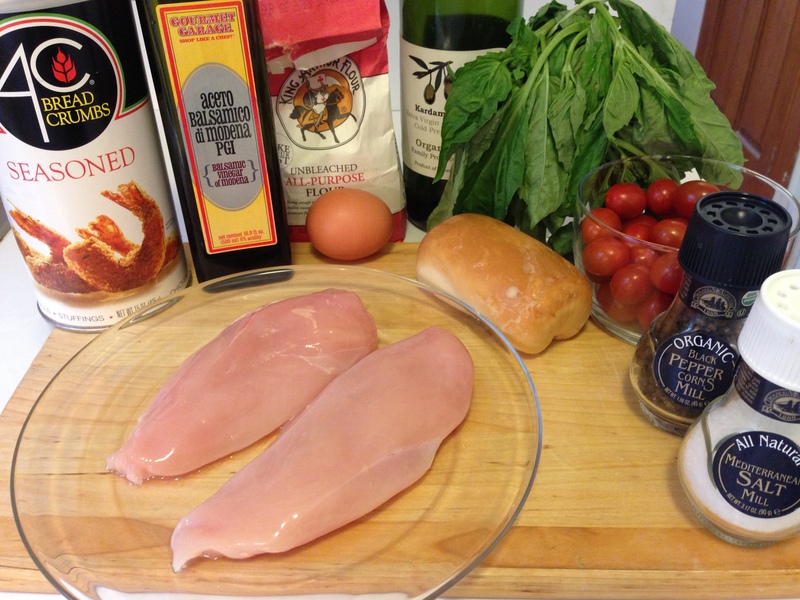 Finally, dredge the chicken in the bread crumbs. Do the same to the other cutlet. 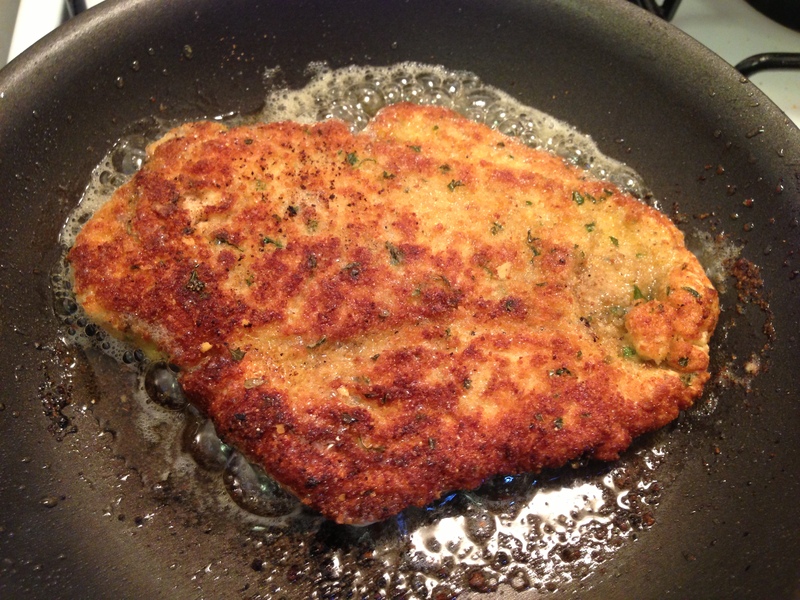 Place the breaded cutlet into the hot oil. It should sizzle when it hits the heat. Let it cook about 3-4 minutes per side until there’s a nice even brown coat on the bread crumbs. The process should go something like this. Remove the chicken from the heat and begin to assemble. 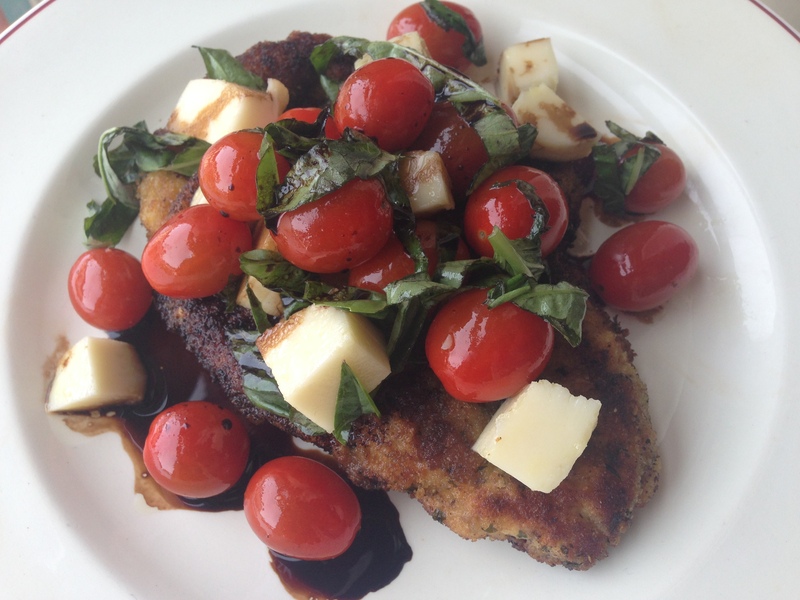 If you have good balsamic vinegar–meaning it’s thick and syrupy–you can add about 2-3 tablespoons of it to the caprese salad in a small frying pan over medium low heat for about 1-2 minutes until the cheese is slightly softened and the salad is warmed through. But if you’re cheap like me and can barely afford a bottle of mediocre olive oil, it is possible to transform your watery balsamic vingear into something special. Heat the 1/2 cup of the vinegar in a saucepan over low heat with a sprinkle of brown sugar, and let simmer for 3-5 minutes. It should start to bubble and thicken slightly. 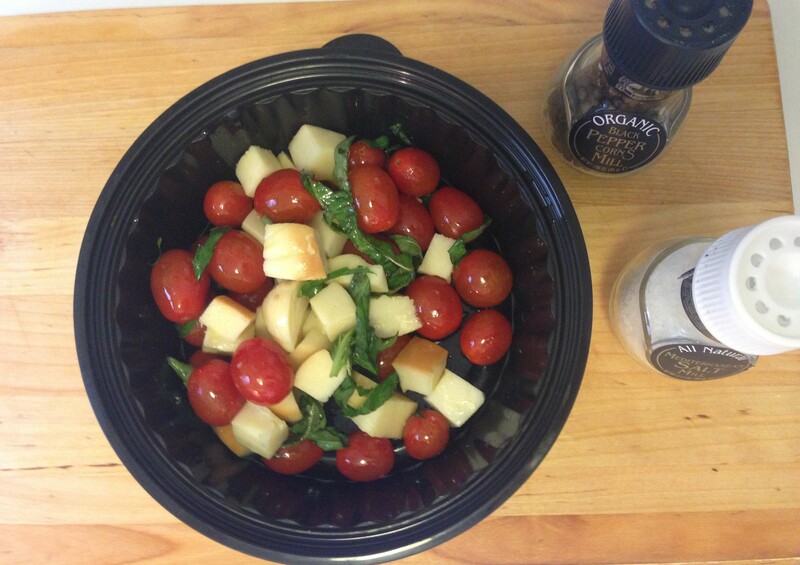 Once it reduces by about half, add the caprese salad for 1-2 minutes just to soften the cheese slightly, warm the tomatoes, and get an even coat of the balsamic on the salad. 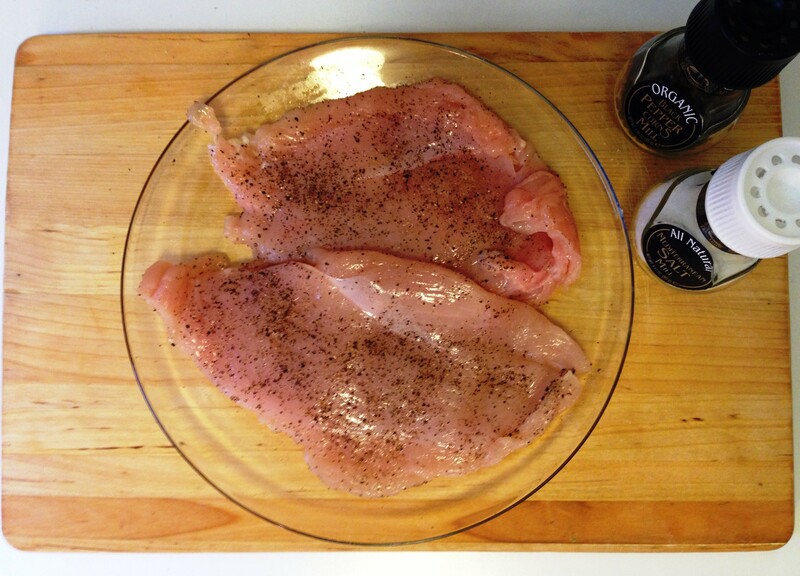 If you prefer a more summery take, just drizzle the warm balsamic vinegar over the salad and chicken… Yum! Fieldhouse Fun Fact: It wasn’t the rolling Tuscan hills or vineyards that captivated my 12-year-old self when my parents took me to Italy, instead it was the world of what olive oil should taste like (despite that I later learned the majority of Italian olive oil is imported from Greece). I now have a bottle of Greek olive oil in my kitchen that was given to me as a gift by a Greek friend of mine. The best part was that he gave it to me in a wine bottle bag! Clever.